Audria Herrera, a Colorado Northwestern Community College nursing student, poses for a photo recently at the Craig campus. The 34-year-old has received the college’s Brett Stearns Memorial and Albin Salton Nursing scholarships, and plans to use the funds to further her nursing education after she graduates with her associate's degree in nursing next month. • Colorado Northwestern Community College nursing student recently received two scholarships through the CNCC Foundation. • Audria Herrera was notified in March that she was chosen to receive the Brett Stearns Memorial Scholarship and the Albin Salton Nursing Scholarship. • The awards give Herrera a combined $2,800 to spend on books and tuition as she continues her education. • She plans to use the funds to pursue a master’s degree after she graduates from CNCC on May 5. Until recently, Colorado Northwestern Community College scholarships were barely out of Audria Herrera’s reach. 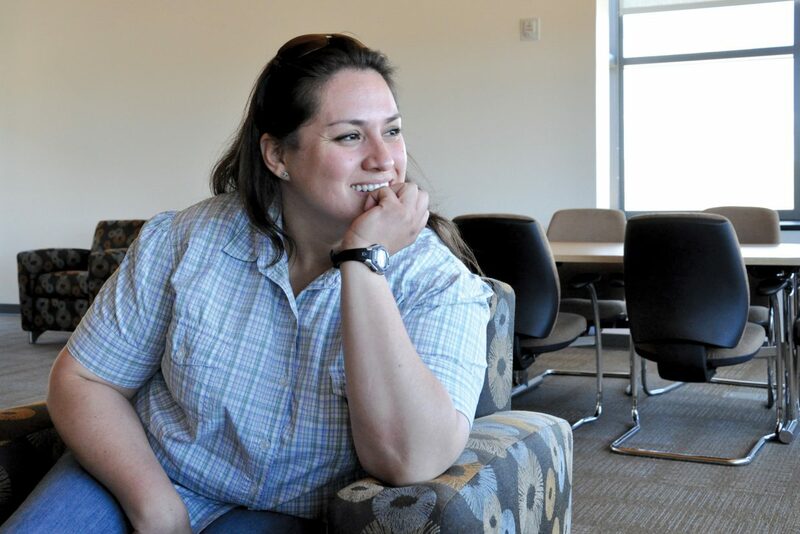 “I have been applying to pretty much all scholarships that have been available, and including ones that I’ve been able to come across over the Internet,” said Herrera, who is earning her associate’s degree in nursing at CNCC’s Craig campus. But when it came to landing scholarships offered through the college, she always came in as the runner-up, she said. This semester, however, the tables turned for the 34-year-old Yampa resident. In March, she learned she was the recipient of the Brett Stearns Memorial Scholarship and the Albin Salton Nursing Scholarship, both of which are offered through the Colorado Northwestern Community College Foundation. Combined, they will give her $2,800 to apply to books and tuition during the next stage of her education. It’s not often that one student receives both awards in the same semester, Foundation Director Becky Niemi said. Like many elements along Herrera’s path toward a new career, the scholarships unexpectedly opened a door and confirmed her belief that she’s on the right path. Her dream to become a nurse took root when she was practicing animal science in southern California. “I had reached my roof,” she said, and realized further education was her best option. She moved to Craig in April 2010 with intentions of becoming a nurse and stumbled upon CNCC’s nursing program. “It was kind of funny how things work out, and you kind of end up where you’re supposed to be,” she said. The college opened an avenue into a new career path, as well as new financial challenges. To support herself, Herrera holds down a full-time job at The Memorial Hospital as a phlebotomist and emergency room tech. At the same time, she’s also a full-time student at CNCC. Receiving some financial aid helped ease the financial burden and “definitely gave me a chance to breathe,” she said. With scholarships in hand and her graduation only a week away, Herrera is considering her options. She plans to eventually earn her master’s degree and, perhaps later, her doctorate, she said. “It’s going to take time for me to reach my goals,” she said. But she’s well on her way, and she’s not looking back.